Attari, an old historical town, is located halfway between Lahore and Amritsar. Since partition, the international border between India and Pakistan runs quite close to it, thereby making it the last frontier town of India. This land is the heart of Majha, of tough and hardy peasants, whose sons have always found a place of pride as soldiers from times immemorial. As one takes the road from Amritsar to Attari, a distance of 16 miles, the imposing city wall and big havelis come into view from quite far. Along the road, there is a pucca tank, in the outskirts of the town. Quite close to it stands the Samadhi of the founder of this town, General General Sham Singh Attariwala. Sham Singh's father Sardar Nihal Singh was so loyal to his master Maharaja Ranjit Singh that according to local legend when the Maharaja fell seriously ill at a place called Wanieke, Nihal Singh went around his bed seven times praying to God Almighty to pass his master's illness to him. It is said that from that day Ranjit Singh regained his health and Nihal Singh died soon after. Nihal Singh's son Sham Singh had caught Ranjit Singh's eye at an early age by his dash, vigor and soldierly qualities. Soon he made his name in his first campaign when in command of a battery of guns at the siege of Multan in 1818 and in spite of being wounded, he was the first to storm the breach in the fort and take it. Thereafter he served with distinction in many other campaigns in the North and gained as great a name for courage as his illustrious father. The clan of Attariwalas gained so much strength and influence that in order to have them on his right side, Maharaja Ranjit Singh sought the hand of Sham Singh's daughter for his grandson Prince Naunihal Singh. The marriage took place at Amritsar on the 7th March, 1837. History records it as the last marriage of its kind in oriental splendor and pageantry. Sir Henry Fane, the British Commander-in-Chief, was present on the occasion. The wedding is said to have cost the Attari Sardar Rs. 15 lakhs. In the absence of a strong hand after the death of Maharaja Ranjit Singh, the rot which set in the Kingdom of Punjab is too well known to the students of Sikh history. The intrigues of selfish and treacherous sirdars at the court so disgusted Sham Singh that he retired from the court and settled down at Attari to spend the last days of his life in prayer and meditation. The intrigues at the Lahore Durbar culminated in a plan to divert the powerful Khalsa Army towards the British. Sham Singh was called by Maharani Jindan for advice. He strongly protested against. On the other hand he was dubbed as a traitor and Jindan called him a coward and not true to the salt of her late husband. Sham Singh needed no more of such words for he was anything but a coward. He returned to Attari and in the dusk of his age, he once again donned his armor and followed by loyal horsemen, left for his rendezvous with destiny. Historians are of the opinion that the battle of Sabraon of the First Sikh War (1846) where Sham Singh was in command of troops should never have been lost. The morale of the soldiers was high, some were seasoned veterans of many campaigns, and were led by devoted soldiers. But that was not the intention of the traitors at the Durbar who did eve~1hing possible to starve them of ammunition and other administrative support. The night previous to the battle,. it had rained heavily and the river Sutlej was in spate. Tej Singh, a court noble, came to Sham Singh's camp at night and tried to persuade him to beat a retreat while the pontoon bridge was still intact. Sham Singh was infuriated. At this Tej Singh taunted him by saying that if he considered himself so brave and upright why doesn't he take a pledge to fight till the last. Sham Singh asked for the Holy Granth to be brought and standing before it in all humility he took a vow that he will return victorious or perish. As the dawn was breaking, the troops moved into attack. 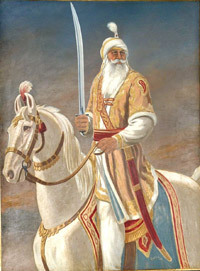 Sham Singh, tall and handsome with flowing grey beared, donned saffron robes, the garment of a shahid, and mounted his white charger. Drawing the sword in his right hand and shouting Sat-Siri-Akal, he charged at the enemy, with his followers at his heels. For a moment the British troops were flabbergasted for they had never seen anything like this charge before. Soon they recovered their wits and the firing became intense. Sham Singh's followers started dropping and soon mere handfuls were left. The old Sirdar fell at last. When his body was examined, seven bullets had pierced his chest; all from the front and none from the back. Just as he had wanted. The battle of Sabraon was lost but out of respect for the gallant adversary, the British ordered ceasefire and allowed Sham Singh's followers to take his body away. The body was brought back to Attari on elephant back after seven days march. His wife put on her bridal dress and ornaments and performed Satee at his funeral pyre. This is the last Satee recorded in history. To this day Attariwalas do not wear saffron color at weddings and on other happy occasions. Lavish tributes were paid to this hero, from the Governor General and British Commander-in ­Chief to lower commanders who fought against him. Thus records Griffin, the British historian, "Sirdar Sham Singh was one 01 the best representatives of the Jat race which, for manliness, honesty, strength, and courage is second to none in the world. His death was a great loss for there was no one to take his place. There were, it is true, many of humble ranks in the villages around Gujaranwala, Lahore and Amritsar of equal, courage, simplicity and devotion to the interests of the country, but none among the intriguing Sirdars at the Court. Had there been more chiefs like him, the Sikh nation would have preserved the independence, which it madly threw away". Thousands of people die in this world everyday and pass into oblivion. Sham Singh's martyrdom had a meaning and significance. It is one of those sacrifices which keep a nation alive and serve as a beacon guide to the coming genera­tions. A nation without tradition of sacrifice and devotion has no right to exist as such. Sham Singh's extreme act of gallantry has not gone in vain. Shah Mohd., the famous Punjabi poet immortalized him in his epic poem. Today the country remembers him with gratitude. A befitting memorial is yet to be erected at his native village at Attari, though a beautiful portrait of his hangs in the Sikh Regimental Center museum a good reminder to our young soldiers of the stuff we are made of.